Instead of looking forward to traveling to England for graduate study at the University of Oxford in October, Jin Park fears he won't be able to return to the U.S. as a result of President Trump ending the DACA program in 2017. Jin Park could hardly believe he he’d been chosen to study at one of the world’s most-storied universities when he was named a Rhodes Scholar last fall. A 2018 graduate of Harvard College, Park, 23, was the first person in the Deferred Action for Childhood Arrivals (DACA) program to win the honor. But instead of looking forward to traveling to England for graduate study at the University of Oxford in October, Park is unsure he can safely begin his Rhodes studies because he might not be able to return to his Queens, N.Y., neighborhood. On Wednesday, Park testified in Washington before a hearing of the House Judiciary Committee about the precarious position that he and others living with DACA status are in and the “impossible” choice he says he faces as a result of current U.S. policy. After President Trump terminated the program in 2017, DACA recipients, who are often called Dreamers, learned they were no longer automatically protected by a provision known as advance parole that allowed them to leave the country temporarily to study, work, or visit family members and then return without complication. At Harvard, Park studied molecular and cellular biology, as well as migration studies. At Oxford, he hopes to learn to improve immigrant health services and outcomes in his own Queens neighborhood of Flushing. 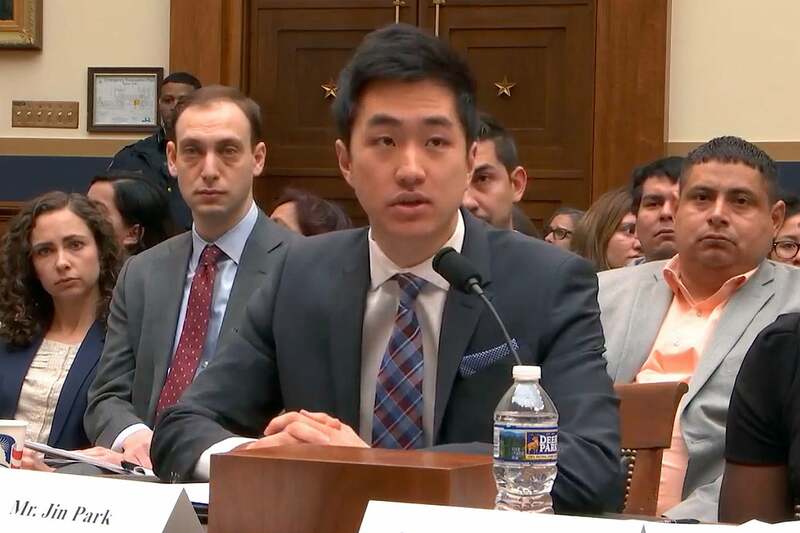 Jin Park testified in front of the House Judiciary Committee about his current DACA status. Park was among a small group of graduate students and others with DACA or Temporary Protected Status (TPS) who testified before the Judiciary Committee, urging Congress to craft a permanent solution that clarifies and protects DACA and TPS recipients’ status while lawmakers continue to grapple with the larger, complicated matter of immigration reform. During a trip to Capitol Hill last month, Harvard President Larry Bacow met with several lawmakers, including U.S. Sen. Mitt Romney J.D./M.B.A. ’75 (R-Utah), a former governor of Massachusetts, and U.S. Rep. Jim McGovern (D-Mass. ), appealing to Congress to enact legislation that would protect DACA students such as Park from having to choose between furthering their education and being permanently separated from their families and from the only country that most know as home. President Barack Obama instituted DACA as an executive action in 2012 to allow qualified undocumented individuals, primarily minors, to remain in the U.S. for some time without fear of prosecution and deportation if they met certain criteria. Because his policy did not have the force of law, Trump had the authority to end the program without consulting Congress or the courts. Unlike immigration reform, which remains a broadly polarizing issue, protecting Dreamers like Park who are living and contributing to the nation is much less controversial. “Despite bipartisan support in Congress and the support of nearly three-quarters of the American public, legislation has never been enacted. Today’s hearing is hopefully the first step in ending that injustice,” said committee chairman Jerrold Nadler (D-N.Y.). Katharine Moon, Wasserman Professor of Asian Studies at Wellesley College, speaks on a panel about last week's summit between President Trump and North Korean leader Kim Jong-un.